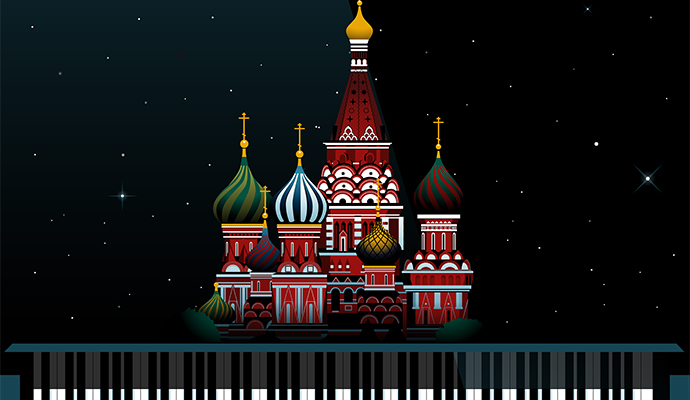 Tchaikovsky and Rachmaninoff: great pianists, great orchestrators, and great melodists. What better pair to combine for a smashing program. Rachmaninoff was just hitting his stride during the composition of this concerto, containing beautiful melodies and the exotic glamour of eastern Russian folk songs. Tchaikovsky, represented here by his fourth symphony, was in bright and joyous spirits. Although the opening movement has moments of darkness, the raucous finale will leave you—and our musicians and conductor—breathless! Rachmaninoff was a very successful pianist and composer, in spite of bouts of severe anxiety and depression. Piano Concerto No. 2 was dedicated to his therapist Dr. Dahl and became his signature piece, replacing his popular C-sharp minor prelude as the favorite of his fans. During the year that the Symphony No. 4 was composed Tchaikovsky cycled through bouts of extreme melancholy and manic optimism. The year, 1877, included the appearance of a patron, and of a former student whom he felt compelled to marry, leading to a suicide attempt and a psychological breakdown. Taiwanese American pianist Steven Lin is an immediately engaging and imaginative young artist, applauded by the New York Times for playing that is “…immaculately voiced and enhanced by admirable subtleties of shading and dynamics.” The pianist’s broad musical interests allow him to move with ease between concertos, recitals and chamber music, enjoying appearances world-wide at important venues including the Louvre and Salle Cortot in France, National Dublin Hall in Ireland, Seoul Arts Center in Korea, Sendai Cultural Center in Japan, and Avery Fisher Hall in the United States.